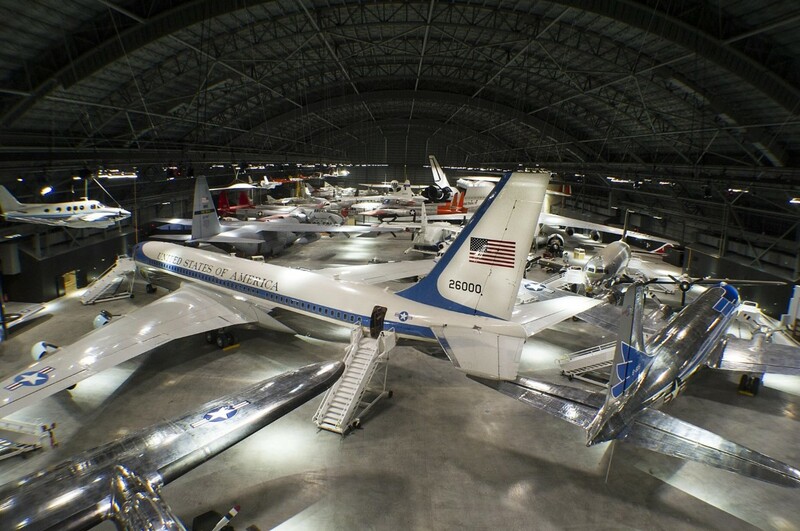 ﻿ National Museum of the U.S. Air Force - Ohio. Find It Here. The world's largest military aviation museum features more than 360 aerospace vehicles and missiles from the beginnings of military flight to today's stealth technology, amid more than 19 acres of indoor exhibit space. Thousands of personal artifacts, photographs and documents further highlight the people and events that comprise the Air Force storyline. Noteworthy aircraft on display include Bockscar, the B-29 that dropped the atomic bomb on Nagasaki; a B-52 bomber; an F-22A Raptor; the world's only permanent public exhibit of a B-2 stealth bomber, and the Space Shuttle Exhibit featuring NASA's first Crew Compartment Trainer (CCT-1), which was used to train astronauts on operating the Space Shuttle Orbiter. 3D theatre, gift shop, interactive flight simulators, virtual reality transporter, and cafes.